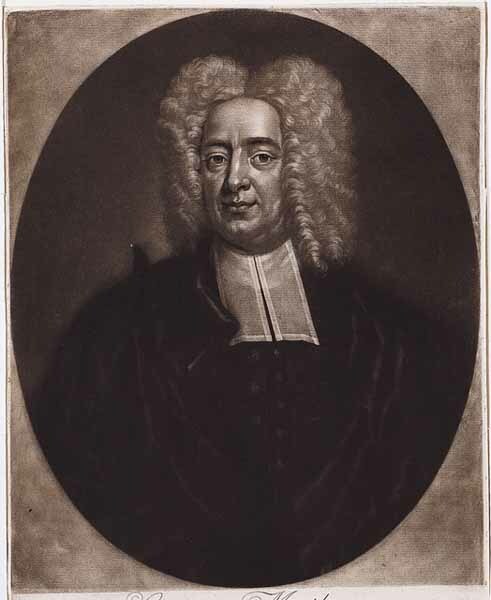 Cotton Mather had quite the wig. Wigs were, everyone knows, “just the fashion.” But Mather’s wig can also be seen as a statement of his Puritanism. Against Puritan condemnation of the vanity of wearing someone else’s hair, Mather asserted a Reformed theology of the disjuncture between outward appearances and the internal truth of a redeemed soul. There was some real controversy around wigs in Puritan New England. As Dr. Richard Godbeer documented in a 1997 article for the Proceedings of the Massachusetts Historical Society, there were 17th and 18th century debates about whether wigs were dishonest. There were arguments that wigs were a subversive vanity, undermining the natural order. They were, to some, nothing less than a rebellion against God. Samuel Sewell, for example, said that God gave him his hair, and it seemed wrong to want someone else’s. Sewell was an adamant opponent of wigs. He went out of his way to condemn wig-wearers and even tried to rally the Puritan clergy to take a stand against the fashion. Mather, however, wasn’t interested. Sewell records in his diary that in 1690, Mather preached it was “a sign of a hypocrit” to “be zealous against an innocent fashion,” instead of more serious matters. Mather reminded his congregation of Christ’s admonition about gnats and camels. Mather gave the issue no more attention. He did, however, wear a wig for his 1728 portrait, memorializing himself in someone else’s luxurious curls. Sewell fits the Puritan stereotype of the harsh busybody, whose self-rightousness is matched only by his pettiness. Mather, however, was as much a Puritan as anyone. So while his wig was “just the fashion,” it was a statement, too, about how Puritanism need not obsess over every hair on your head. This entry was posted in Blog and tagged Cotton Mather, hair, Puritanism, Richard Godbeer, Samuel Sewell, wig on 26/11/2017 by Daniel Silliman.